Bhubaneswar:13/8/18: Odisha Governor Professor Ganeshi Lal released the Odia edition of ‘Exam Warriors’, a book written by Prime Minister Narendra Modi, in a function held today at Jaydev Bhawan here. Addressing the audience Governor Ganeshi Lal said that, a common student can be a superman with his strong determination and will power. With 25 super mantras, advice to parents and teachers, and a set of useful yoga asans, Prime Minister Narendra Modi has done what perhaps no other head of a country has done – prepare students to face examinations without the accompanying stress, he added. 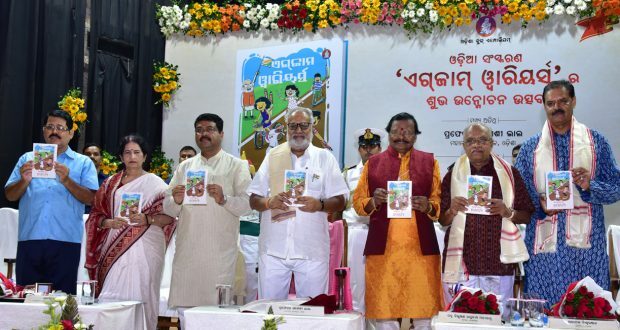 The release function was also graced by Minister for Petroleum and Natural Gas Dharmendra Pradhan, Padmashree Dr. Pratibha Ray, Shilpi Guru and MP Raghunath Mahapatra, Adhyapak Biswaranjan and many other eminent personalities. On the occasion Pradhan said that, it was his dream to make the book available in Odia and it should be reached to every student of Odisha. He said adding that intellectual power of every Odia student is the main resource of this state. This book would be very helpful for all students who are going to appear various examinations and interviews. The Odia edition of the book was released by Odisha Book Emporium. Dedicated to “the youth of New India”, the book is integrated with the Narendra Modi Mobile App. The idea, according to Modi, is to create an Exam Warrior Community. Previous: Bhubaneswar :13/8/18:Anil Mukim, IAS, Secretary, Ministry of Mines, Government of India & Dr. Tapan Kumar Chand, CMD, NALCO, met the Hon’ble Governor of Odisha Prof. Ganeshi Lal and discussed about the Mining and Aluminium scenario in the country in general and Odisha in particular.